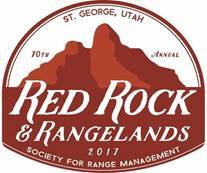 CONFERENCE THEME: The theme of this year’s conference is “Red Rock & Rangelands,” and it highlights the juxtaposition of spectacular geology and diverse rangelands in the region around St. George. The southwest corner of Utah is an ecotone at the convergence of three major rangeland regions: the Colorado Plateau, Great Basin, and Mojave. Range management in this region is especially complex due to the high biophysical variability, high concentration of natural wonders and associated recreation activities, and diverse set of stakeholder groups. We especially welcome proposals that highlight the variety of rangeland environments and habitats, multitude of rangeland land-uses, and diversity of people who manage and depend upon rangelands in the southwestern US. CONFERENCE FORMAT: Sessions will vary in structure in order to provide a robust conference experience for presenters and participants. Presenters are asked to identify their preferred format in their proposal, however, proposal reviewers may suggest alternative formats and/or combinations of topics to form symposia. SYMPOSIUM SESSIONS: Are comprised of a number of presentations, all related to a unifying topic. Each presenter will be provided with approximately 20 minutes to speak. After all have presented their work, there will be a shared time at the end for questions and discussion. It is not assumed that those presenting in a symposium format will collaborate before the session, only that they share the time. The idea is that, by providing information and viewpoints on different aspects of a topic in one session, rich discussion among presenters and the audience will ensue. FORUM SESSIONS: Are sessions that present research, theory, concepts, and practices. Concurrent sessions are 45 minutes long and consist of either one presentation for the full 45 minutes or, in some cases, two presentations back-to-back (about 20 minutes each). WORKSHOP SESSIONS: Are designed to provide an opportunity for in-depth discussion of current and emerging topics of interest to the rangeland community. We encourage workshop proposals that bring together people working on new and developing research topics that favor highly interactive discussions. Those proposing a workshop should provide information showing that the workshop is of interest to the rangeland community, and explain why a workshop on this topic is beneficial. HOTELS: Hilton Garden Inn and the Fairfield INN are SOLD OUT! Visit the Hotel & Travel tab for info on the other hotels still available—many still are within walking distance! SPONSORSHIPS: interested in having your company or agency sponsoring this year’s meeting? Visit the sponsorship packet to learn more.